1 drawing on paper ; image 4.125 x 4 in., on sheet 9.5 x 6 in. 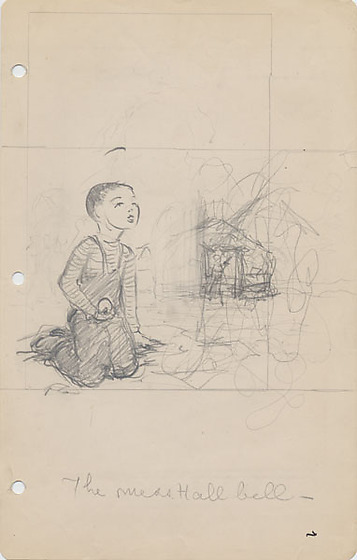 Pencil drawing of a boy in a striped shirt and overalls kneeling on the ground with a ball cupped in right hand, center left. He has a closely cropped haircut ; his head is raised as if listening to the mess hall bell. In the distance, a person stands in the doorway of a structure ; squiggle marks surround it. Horizontal lines span the paper under the boy's knees and above his head; two vertical lines frame main images, extending to top of paper and close with horizontal line. Three holes punched along left edge.